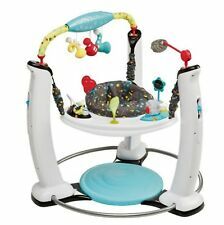 It includes rock, spin and jump actions that provide your baby with pleny of exercise to strengthen legs, back and neck muscles. Baby Baby Activities & Gear Bouncers & Rockers. With rock, spin and jump actions that provide your baby with plenty of exercise to strengthen legs, back and neck muscles. Rock, spin and jump actions that provide your baby with plenty of exercise to strengthen legs, back and neck muscles. Rock, spin and jump actions that provide your baby with plenty of exercise to strengthen legs, back and neck muscles. Baby Baby Activities & Gear Baby Jumpers. BEST PRICING. Color: Jam Session. Style: Jam Session. material_composition: Birth to 3 Months. Extra jump allows baby to exercise legs while being entertained. Smart electronic toys interact with one another providing baby with fun lights and sounds in 3 genres of music. Rock, spin and jump actions that provide your baby with plenty of exercise to strengthen legs, back and neck muscles. Baby Baby Activities & Gear Baby Jumpers. We do our best to process as quickly as possible. Baby with plenty of exercise to strengthen muscles and improve gross motor skills. Extra jump allows baby to exercise legs while being entertained. Style Jam Session. Jump, spin and reach actions also provide. 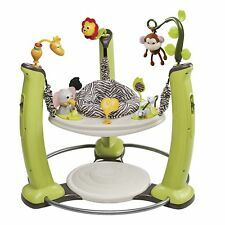 Evenflo ExerSaucerJump & Learn Stationary Jumper - Jungle Quest. Jump, spin and reach actions also provide baby with plenty of exercise to strengthen muscles and improve gross motor skills. Spin and jump actions also provide baby with plenty of exercise to strengthen gross motor skills. Evenflo ExerSaucerJump & Learn Stationary Jumper - Jungle Quest. Spin and jump actions also provide baby with plenty of exercise to strengthen gross motor skills. Extra jump allows baby to exercise legs while being entertained. Spin and jump actions also provide baby with plenty of exercise to strengthen gross motor skills. Style: Jam Session. Extra jump allows baby to exercise legs while being entertained. Extra jump allows baby to exercise legs while being entertained.